"With dementia, the brain cells, or neurons, that you need for cognitive skills are no longer working properly. Then, they're not even there anymore because they die. That's what leads to dementia; you're losing neuronal capacity." Feinstein has studied the protein called "tau" for about 30 years, using test tube biochemistry and a variety of cultured cells as models. 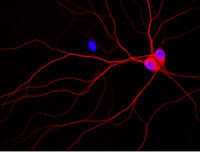 Under normal conditions, tau is found in the long axons of neurons that serve to connect neurons with their targets, often far from the cell body itself. Among tau's major functions is to stabilize microtubules, which are an integral part of the cellular cytoskeleton that is essential for many aspects of neuronal cell structure and function. It has been known for many years that a small peptide named amyloid beta can cause neuronal cell death and Alzheimer's disease, although the mechanism for how it works has been poorly understood. Recently, genetic evidence has demonstrated that the ability of amyloid beta to kill neurons requires tau; however, what it does to tau has been enigmatic. "We know amyloid beta is a bad guy," said Feinstein. "Amyloid beta causes disease; amyloid beta causes Alzheimer's. The question is how does it do it?" He explained that most Alzheimer's researchers would argue that amyloid beta causes tau to become abnormally and excessively phosphorylated. This means that the tau proteins get inappropriately chemically modified with phosphate groups. "Many of our proteins get phosphorylated," said Feinstein. "It can be done properly or improperly." Feinstein added that he and his students wanted to determine the precise details of the presumed abnormal phosphorylation of tau in order to gain a better understanding of what goes wrong. "That would provide clues for drug companies; they would have a more precise target to work on," said Feinstein. "The more precisely they understand the biochemistry of the target, the better attack a pharmaceutical company can make on a problem." Feinstein said that the team's initial hypothesis suggesting that amyloid beta leads to extensive abnormal tau phosphorylation turned out not to be true. "We all like to get a curve ball tossed our way once in a while, right?" said Feinstein. "You like to see something different and unexpected." The research team found that when they added amyloid beta to neuronal cells, the tau in those cells did not get massively phosphorylated, as predicted. Rather, the surprising observation was the complete fragmentation of tau within one to two hours of exposure of the cells to amyloid beta. Within 24 hours, the cells were dead. Feinstein explained that tau has many jobs, but its best-understood job is to regulate the cellular cytoskeleton. Cells have a skeleton much like humans have a skeleton. The major difference is that human skeletons don't change shape very abruptly, whereas a cell's skeleton is constantly growing, shortening, and moving. It does this in order to help the cell perform many of its essential functions. The cytoskeleton is especially important to neurons because of their great length. Feinstein argues that neurons die in Alzheimer's disease because their cytoskeleton is not working properly. "If you destroy tau, which is an important regulator of the microtubules, one could easily see how that could also cause cell death," said Feinstein. "We know from cancer drugs that if you treat cells with drugs that disrupt the cytoskeleton, the cells die," he said. "In my mind, the same thing could be happening here." The Feinstein lab is now at work on the implications of the experiments described in the article. Co-authors of the article are graduate student Jack Reifert and former graduate student DeeAnn Hartung-Cranston. The Journal of Biological Chemistry has been published for more than 100 years.